Our accessory of the week is the parasol, vital for the preservation of a lady’s clear, un-sunburnt complexion—don’t forget, sun worship is a twentieth century phenomenon. And that isn’t all they were good for: they could be a tool for flirtation (or a useful item for fending off too determined a suitor!) And aren’t they just plain fun? 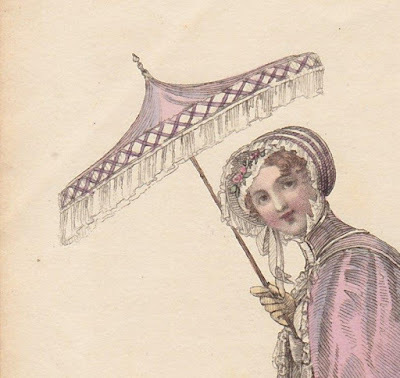 I’m dividing our look at parasols into two posts, though they were much more popular an accessory earlier on than they were into the 1820s and 1830s. Look for lots of images rather than commentary, though I’ll try to supply original text if I have it—the point is to be able to examine multiple examples of each item. Images are drawn from my collection of prints from British publications including Ackermann’s Repository and La Belle Assemblée. However, Ackermann’s had the most detailed plates, so the majority of images you’ll see will be from that publication. These date from 1806-1815. 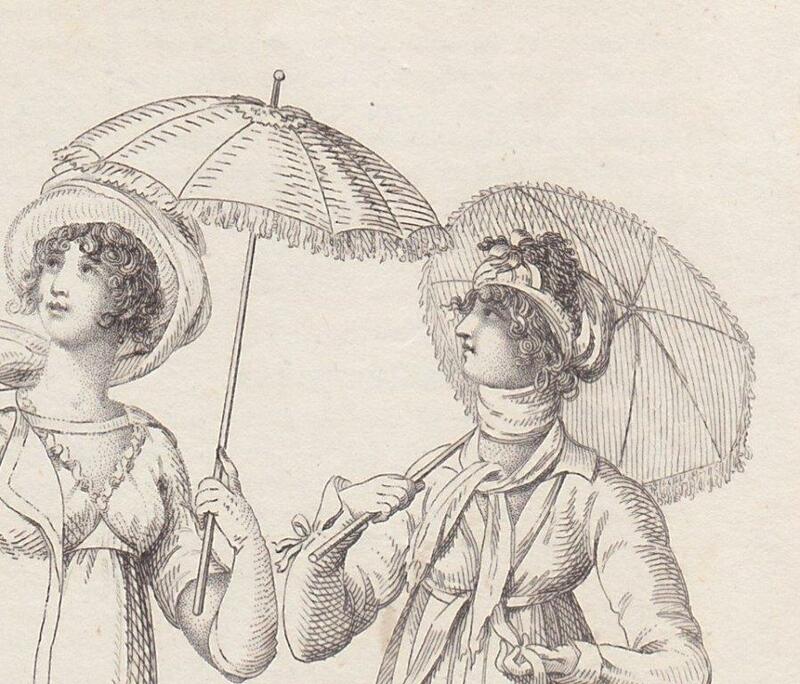 Kensington Garden Promenade Dresses, La Belle Assemblee, June 1806. Promenade Dress, Ackermann's Repository, July 1809. 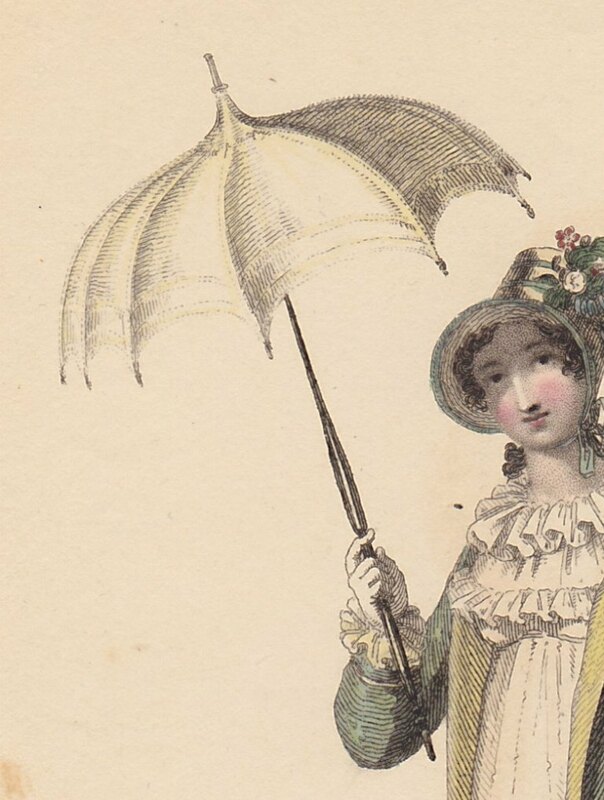 You'll notice in these earlier prints that most of the parasols match some aspect of the dress or pelisse/wrap. I love the net trim on this one. Promenade Dress, Ackermann's Repository, August 1809. Aren't the tassels adorable? Promenade Dress, Ackermann's Repository, September 1809. Walking Dress, Ackermann's Repository, October 1809. 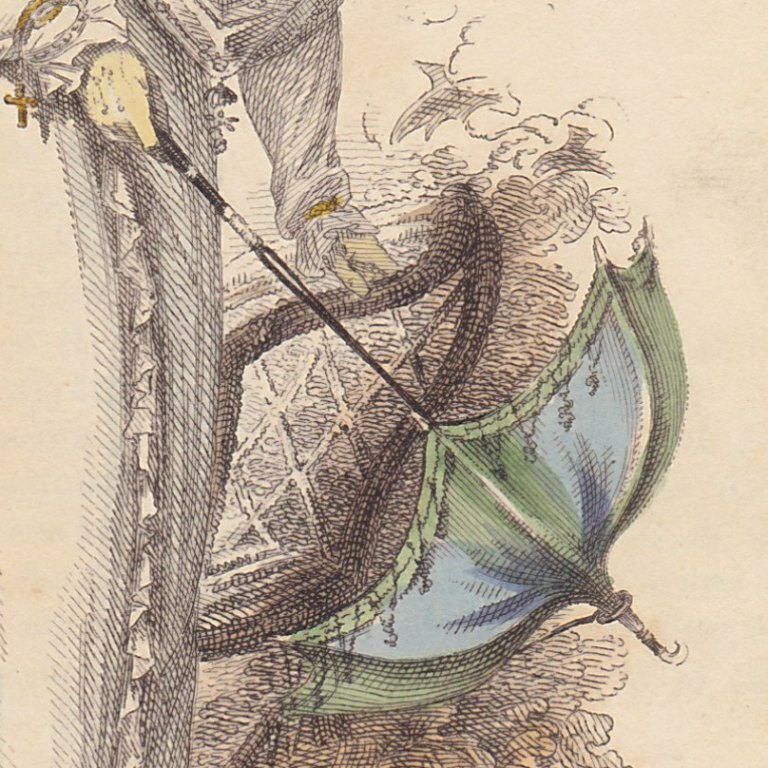 One thing that has interested me is that in many of these prints, the parasol was held by the top rather than the handle when not actually open. Walking Dress, Ackermann's Repository, June 1810. 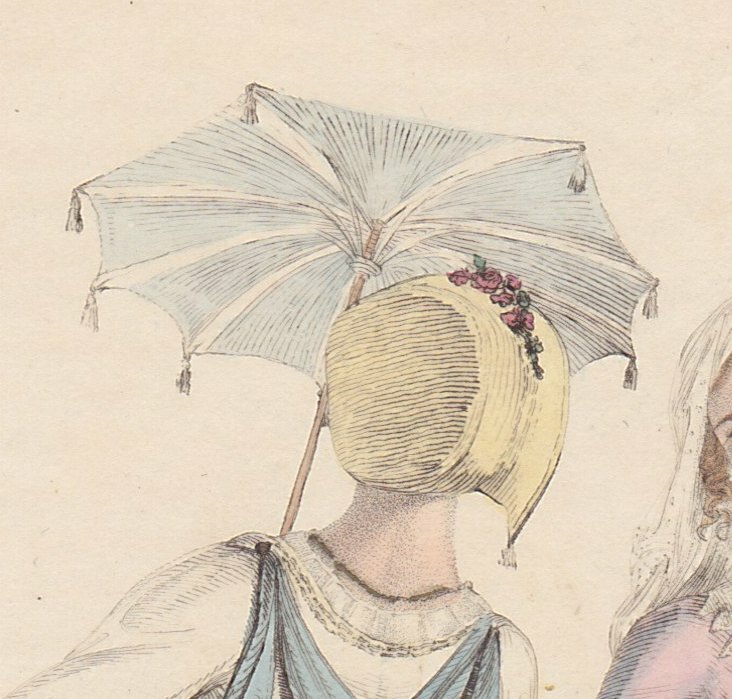 The text describes this as a "Chinese parasol, with deep awning of white silk." Promenade Dresses, Ackermann's Repository, July 1810. I imagine that going out for a walk with a friend might be dangerous if you were both carrying parasols. Walking Dress, Ackermann's Repository, August 1810. This one appears to have a double flounce. Notice also the shaped handle. It is a "Parasol of green Chinese silk, with deep awning." 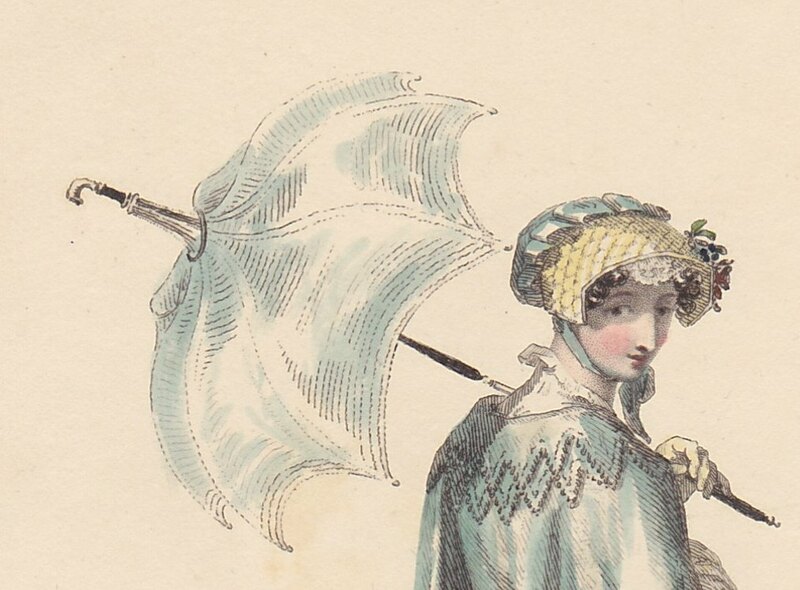 Promenade Morning Dress, La Belle Assemblee, August 1810. A plaid parasol! Promenade Dress, Ackermann's Repository, June 1811. Very natty, green with white trim. Promenade Costume, Ackermann's Repository, September 1811. 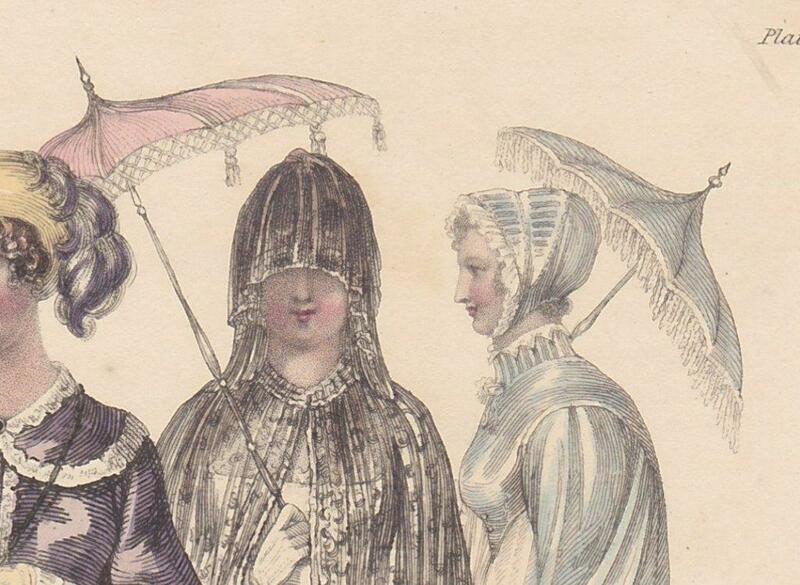 "...parasol corresponding with the cloak, with deep Chinese awning." 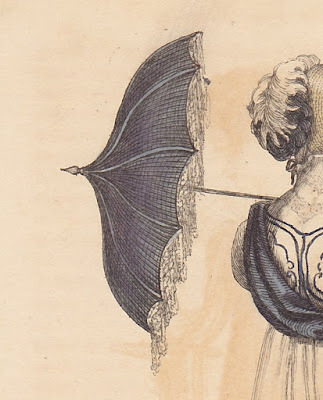 Promenade Dress, Ackermann's Repository, July 1812. Note the little hook at the end of the handle--the first we've seen in these prints. 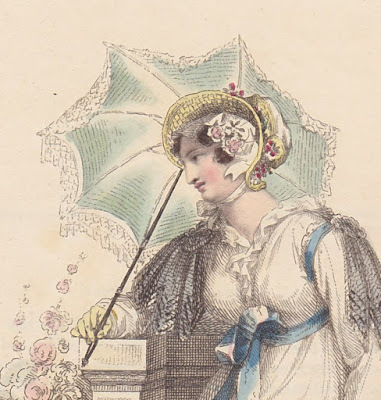 Promenade Dress, Ackermann's Repository, August 1812. "...parasol of correspondent shot sarsnet, with deep ball-fringed awning." Walking Dress, Ackermann's Repository, September 1812. "Parasol of blue shot silk, with deep Chinese frings." 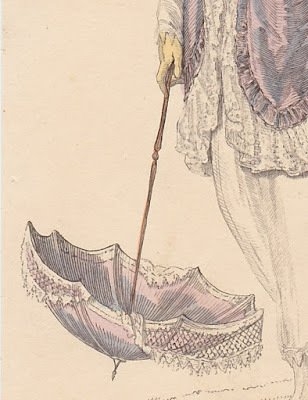 Morning Walking Dress, Ackermann's Repository, July 1813. Note that while the handle is straight, there's a little hook on the end of this parasol! Useful for retrieving a dropped reticule, I suppose. Promenade Dress, Ackermann's Repository, September 1813. 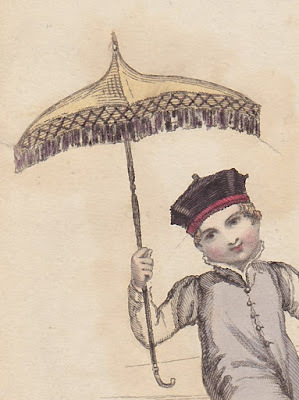 "A large Eastern parasol, the colour of the mantle, with deep Chinese awning." This may be my favorite parasol--it's so architectural! Promenade Dress, Ackermann's Repository, October 1814. Here's something we've not yet seen--a carrying loop at the top! 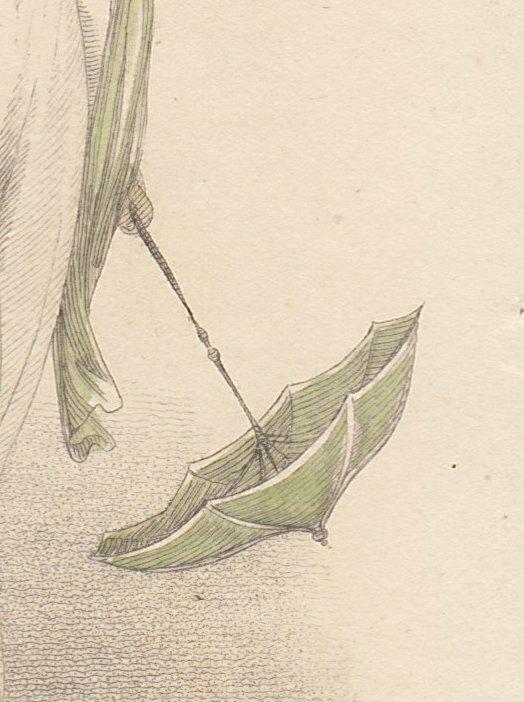 Walking Dress, Ackermann's Repository, May 1815. 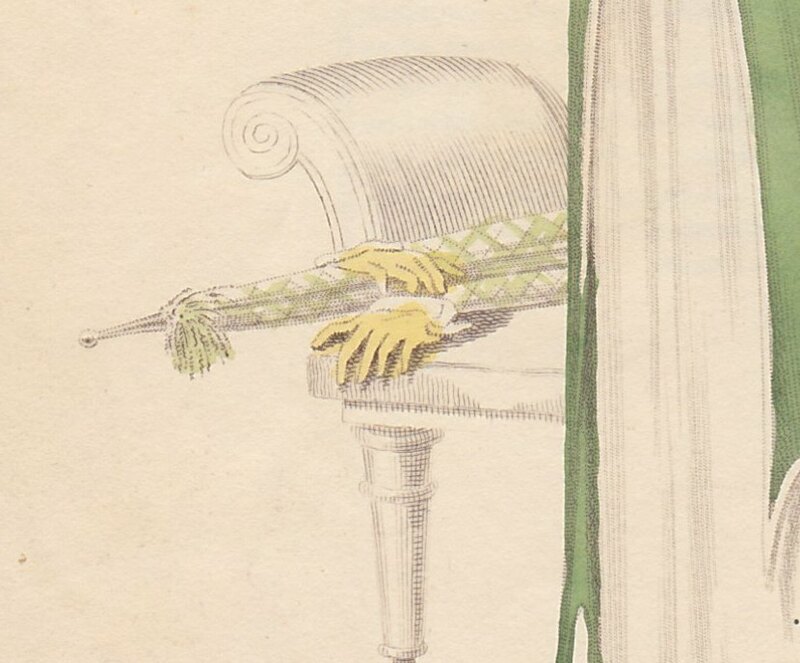 "Parasol of straw-coloured silk." 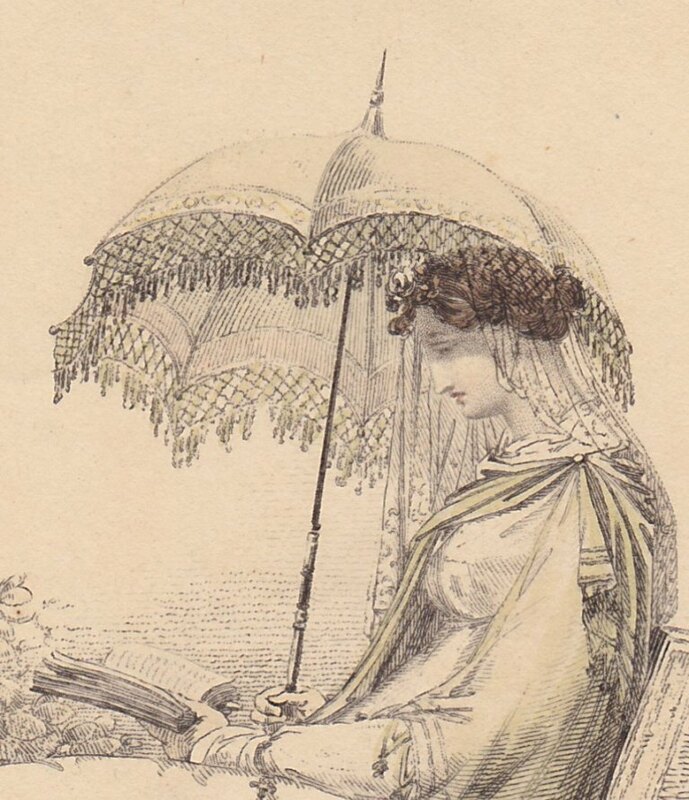 I want so many of these parasols. I have never before in my life seen a plaid parasol before but it looks like it would match a dress of mine. I know! I would love it if they came back into general use!